Everybody knows that real estate market conditions heat up going into the Summer, and then cool down for the Winter months. It has "always" been that way, and it always will be that way. We have been observing a trend of declining buyer activity (new contracts) for the past 75 says or so. This is important information for people who want to sell a home, as it prepares them for the level of competitiveness of the market. Will there be buyers "beating down their doors," or will the streets be empty leaving them to wonder if the home will ever be sold. By measuring new contracts, we have the absolute best litmus test for housing market conditions. So with that being said, the craziness continues. In the real estate graph below, we plot the one-year trend of daily closed home sales (green) and daily new contracts (purple). Since not all real estate contracts actually make it to closing, we normally see double to triple the number of contracts compared to closings. But take a look at our changing real estate market conditions. Contracts are taking a nose dive. And since our measurements show the one-year average, this means that we are seeing non-seasonal changes in the Tallahassee real estate market. Year over year new contract measurements are down more than 50 percent for each of the past two months, and we're about to see fewer contracts than closings (obviously, that cannot last forever ... as it takes at least one contract per closing). 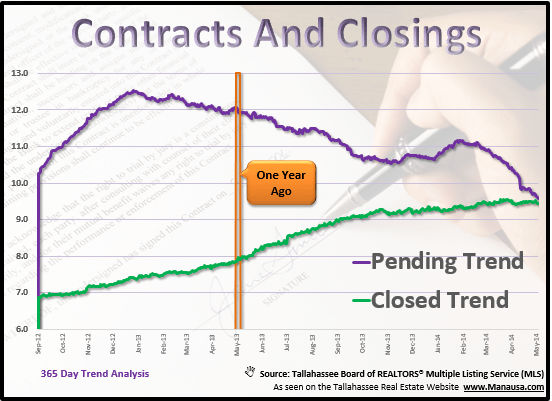 So unlike "forever" or "always," the Tallahassee housing market is cooling as we head into the Summer season. There could be many different culprits on which to lay the blame, but the results are irrefutable. Consider this the official notice ... "always" is not forever. If you are planning on moving this summer and need to sell a home, make sure you hire the real estate company that can demonstrate an aggressive, daily work plan to keep your information fresh on the internet. Don't hire an agent who has a "set it and forget it" approach to selling your house, you'll end up frustrated and un-sold when you need to make the move. If you would like to know more about how our Progressive Home Selling Plan excels during changing real estate market conditions, just drop me a note and we'll take the time to show you how you can move on your desired time schedule.